CRM (customer relationship management) software is a powerful and useful tool that can enhance the sales and marketing process and help build customer relationships. However, many businesses today struggle to get their sales and marketing teams to all use their CRM system. Although the productivity benefits are clear, actually getting employees to accept and use new software and processes can be difficult. 1. "What's in it for me? 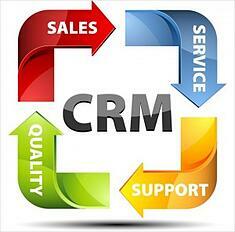 ": Express clearly that the new CRM system you are proposing will directly benefit them and their success. The most common resistance to a new software and/or process is that end users (usually sales people) will see CRM as a way for management to watch them closer, instead of a tool that directly benefits them to sell more. Take the time to explain thoroughly how the CRM system will benefit them directly and not just the company. 2. Make things easy for them: If the new CRM system takes too much effort to learn and use, sales people are very likely to resist putting this extra work into their already busy work day. A CRM system that can easily integrate into their already existing daily routines will be key. 3. Start things slow: Release the CRM system implementation gradually in order to avoid overwhelming employees. Start with entering sales contacts. As soon as they're familiar with this part of the system, begin tracking sales with the new system. Keep on with the process by having employees use the software to create reports.Gradually continue this until they start using every function of the new system in their daily routine. 4. Work how they work: Sales people typically use Outlook throughout the day. Try to find out what sort of sales processes they're already using in Outlook and see what can be leveraged into the CRM system. If the product doesn't work from within Outlook, be sure that it at least syncs seamlessly with that program. 5. Make their commission/pay rely on the activities in the CRM: Once the CRM system has been implemented and the sales team has been trained, make a simple rule that employees will only be paid commission on sales if the contact is in the CRM system. Make sure that this new rule is simple and clear to comprehend. Once the sales team and other employees are effectively using the CRM system, it is important to consistently review and analyze their results weighed against current expectations. Invite employees to review monthly or weekly reports and share their feedback. This will not only build a strong relationship between the product or service and the employees, but also between the manager and the employees. The user adoption rates of the CRM system will quickly improve as employees begin realizing and receiving the benefits of this innovative system. Equation Technologies is a certified Sage partner that specializes in Sage CRM. For help implementing a CRM system that will be beneficial to your company and your employees, or answers to your questions contact Equation Technologies today.